Water is sprayed horizontally. 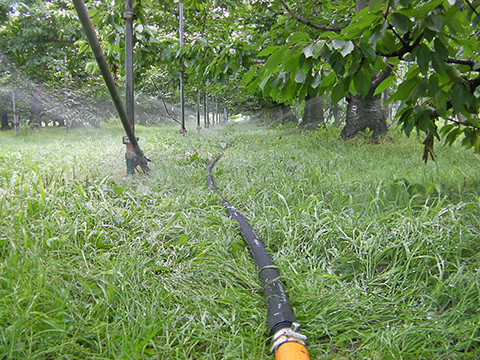 Since fruits and leaves do not get wet, it is suitable for the irrigation of orchard. 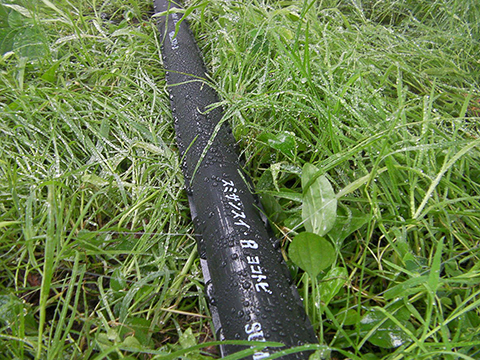 Maximum spray height is lower than 1m and distance is maximum 3.5m from the tube at 2 bar water pressure. Uniform water feed is 100m long at 2 bar water pressure. The fine water holes are on the tube side printed with the product name "SUMISANSUI R-HORIZONTAL", be sure during the tube installation that this side faces up. Start connector named "START CONNECTOR R" can be connected to a 25mm dia. PVC pipe or 40mm female thread connector.